Let it Begin! Let it Begin! We're one week away from the first of two Patchwork shows. I can't wait! The Patchwork Indie Arts & Crafts Festivals are the best shows in Orange County (well technically Long Beach is LA county but they're on the cusp, really). A week from today, Sunday, November 21st from 11am to 5pm, Patchwork will be in Long Beach. The physical address for the Marine Stadium where the show is: 5255 Paoli Way, Long Beach, 90803 BUT the actual location is on the corner of Bayshore & Appian at the lot with launch ramps for boats (just follow the signs). This will be Lucky Zelda's first time selling at the Long Beach show. We'll have purses AND market bags out of new fabrics. Swing by & say "Hello". You won't be sorry you came to this show! PATCHWORK ROCKS!!!! This is NOT your Grandma's craft faire. 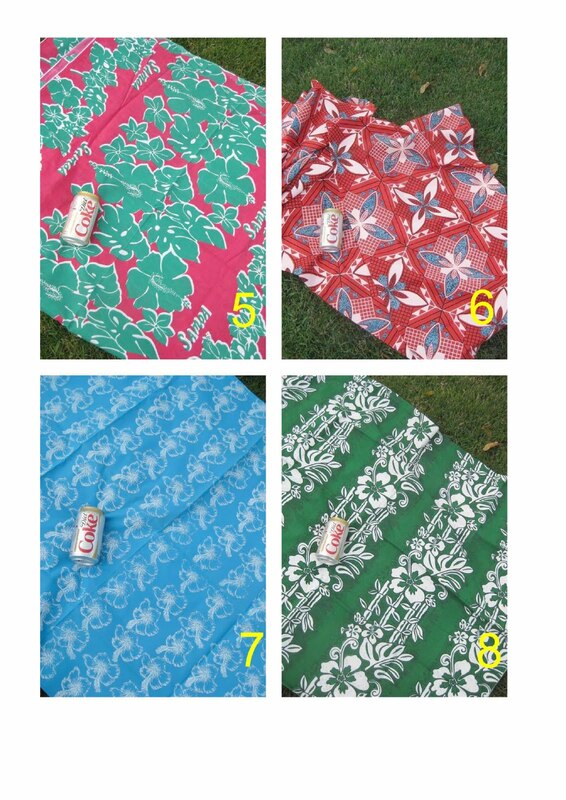 Lucky Zelda's aloha shirts are quickly becoming a customer favorite! 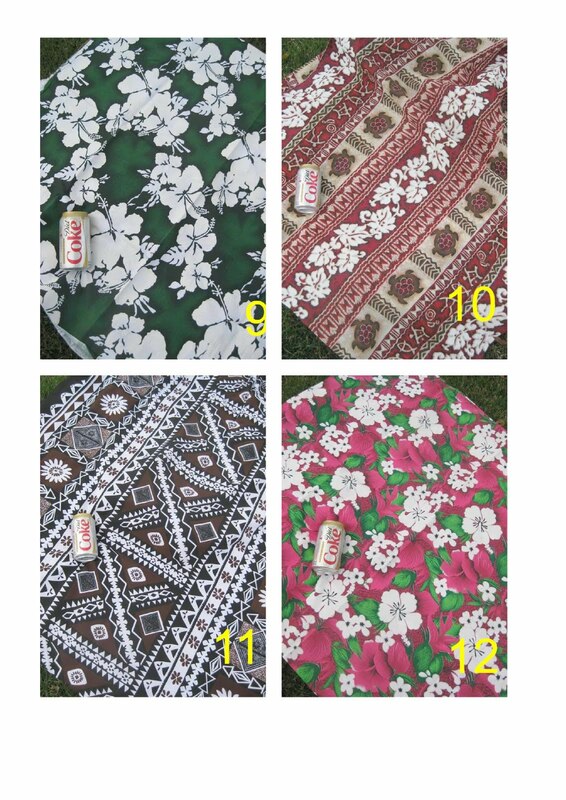 We've received new fabrics from Polynesia that would all look great made into a shirt. Remember that Lucky Zelda's aloha shirts have the style of a Hawaiian shirt without being so loud. 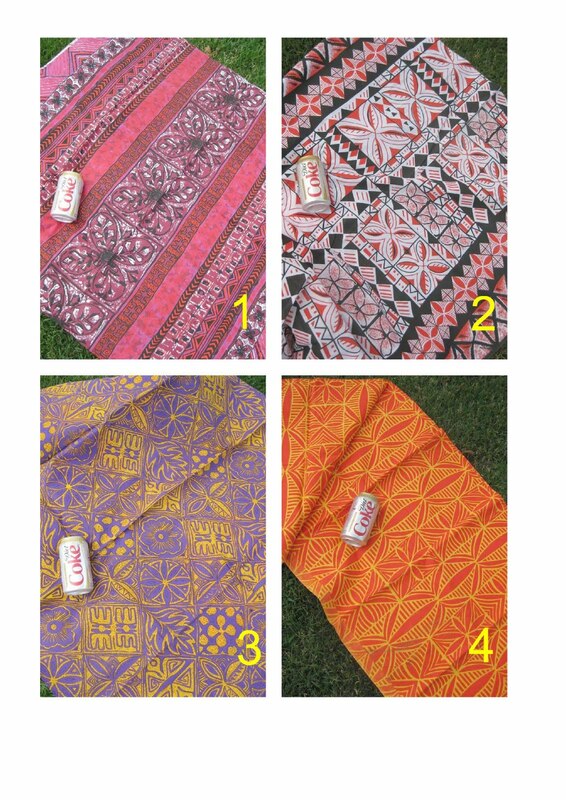 Below are a few swatch cards of our our new fabrics. 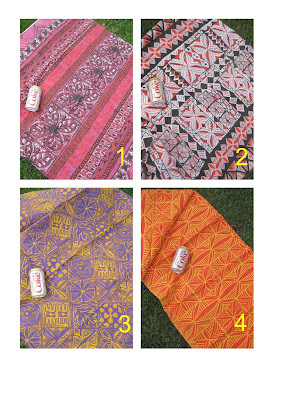 There is a 12 ounce can of soda in each photo to show the size and scale of each of the prints. Please contact us if you would like a Lucky Zelda aloha shirt custom made for you. Matching sets are also available (while the fabric supplies last). Saturday, August 28, 2010 is the First Annual Orange County Foodie Fest. What, you ask, does this have to do with Lucky Zelda? Well, #1 we love food & #2 Patchwork Indie Arts & Crafts Festival is having a mini Patchwork show at the Foodie Fest & Lucky Zelda will be there! This "one-day event will be the ultimate foodie destination, featuring the best in popular mobile eats combined with a unique forum to showcase local entertainment & shopping to help support local charities". See! "local shopping"! That's Lucky Zelda and the other 29 amazing indie arts & crafters that will be part of this Patchwork. 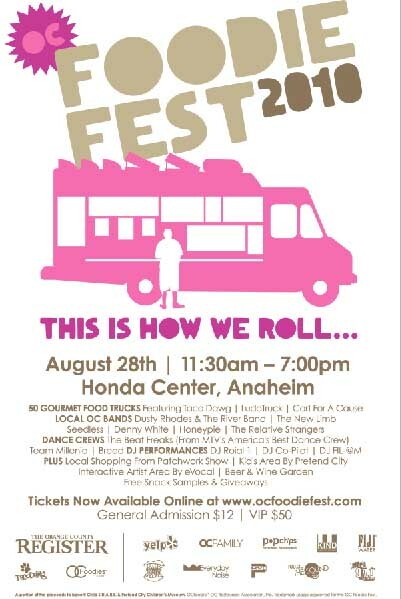 The Foodie Fest will be at The Honda Center in Anaheim 11:30am - 7:00pm. Tickets are $12.00 + parking. As many of you know, The Honda Center isn't far from the Anaheim Metrolink station so be green & save the money you'd spend on parking to spend at this event. Throw your bike on the train & pedal on over! Lucky Zelda was blessed this week to be featured in two different treasuries. It is always such a compliment & being notified that one of our items is featured never gets old! The firt treasury was currated by Go Go Snap. Go Go went with an super fun wimsical collection of circus items. Lucky Zelda's circus tent stripe purse was lucky enough to make the cut. Go Go Snap's shop features beautiful vintage styled correspondence. This item is one of my favorites. Thanks to Go Go Snap for including me in her treasury. Please check out Go Go Snap's shop, the treasury & the other featured shops! The second treasury was made by Beverly at CristPottery. Beverly used a Polynesian theme to feature some really fun items. Lucky Zelda's Samoan block print strapless dress looks great displayed next to the other island items. Crist Pottery makes beautiful pottery that has a vintage style while being fresh & new at the same time. This is my favorite of her current listings. It's just begging for some sorbet to fill it! 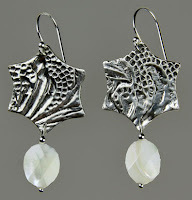 Please check out Crist Pottery's treasury, it's featured shops & of course Crist Pottery's shop! Thanks to Go Go Snap & Crist Pottery for the flattering week in the world of treasuries! Not only was Chocolate Dog Studio awesome enough to include a Lucky Zelda skirt in her delicious treasury but she notified us of the great collection. This is a great treasury featuring a wide variety of items from wonderfully knit creations to gorgeous eye shadow. Please go check out this treasury & all of the talented shops that are represented. And don't forget to go to Chocolate Dog Studio. There you will find great crocheted items & some beautiful art pieces. Thanks Chocolate Dog for including my skirt in your great treasury! Lucky Zelda has had a long winter hibernating from the craft show circle & is hitting it with full force in the next few weeks! 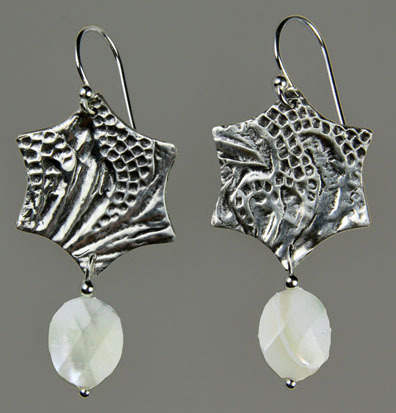 First up is a fundraiser craft show at Arbor Christian Fellowship in Lake Forest, California. Funds raised will help send 3rd through 6th graders to summer camp. This show is coming up quick! This Saturday, May 15th from 8am to 2:30pm. Also enjoy $5 pancake breakfast from 8am to 10:30am. Along with Lucky Zelda there will be other handcrafted items as ell as vendors from Avon, Cookie Lee, Mary Kay, Gold Coast Candles & more. The show is located at 23302 El Toro Road, Lake Forest 92630. Please stop by not only to support Lucky Zelda but to help send kids to camp! Stay tuned for other shows that Lucky Zelda will be participating in!